In a politically unsettled nation, military communities have long been a rock for the Republican Party, solid and true. But new polling data suggest those places have developed some concerns about President Donald Trump. An analysis of Gallup polling data comparing the first 100 days of Trump’s presidency to the month of May shows that Trump’s job approval in military counties dropped sharply in the last month — from an average 51 percent approval and 41 percent disapproval in the first 100 days to 43 percent approval and 52 percent disapproval for May. Taken together that is a 16-point swing, from a net 7 percentage points on the positive side in the first 100 days to a net 9 points on the negative side in May. That’s far greater than the overall change in the Gallup data and it may be a sign of an important shift in those places. The military communities weren’t the only big movers in the Gallup data. Trump’s job approval in exurban communities — wealthy conservative places largely on the edges of urban centers — slid 12 points and dropped into negative territory. But the decline in military communities would be especially noteworthy if it holds in future polls. Those military communities, defined as Military Post counties in the American Communities Project at George Washington University, have voted for Republican candidates in every presidential election since 2000 by double digits. And they were among Trump’s biggest supporters in November. He won those counties by more than 17 points. A number of factors may have driven the May decline. Among them, the Russia/Trump campaign investigation news that dominated the month, from the firing of former FBI Director James Comey to the naming of a special counsel, and the president’s often-antagonistic relationship with intelligence services may have played a role. And the president’s proposed budget calls for another round of base closures — something likely to be unpopular with the communities that serve the military. The biggest question in the military slide, however, may be what it means politically. Democrats quietly say they see a place to make inroads in 2018. The party has made it clear that it is targeting veterans as candidates for midterm races and there may be some reason to think military voters could be good targets for the party. Along with the poll data, members of racial and ethnic minorities, who are generally Democratic voters, now make up about 40 percent of the active U.S. military — up from 25 percent in 1990, according to data from the Pew Research Center. But remember, these communities have long been Republican and demographically speaking they still look like Republicans. They are slightly less diverse than the nation as a whole, 66 percent non-Hispanic white (versus 63 percent nationally). And they have lower levels of educational attainment — 27 percent have a bachelor’s degree or more (versus 30 percent nationally), according to Census data. Gallup numbers suggest they are more culturally conservative. People living in the military communities are more likely to say religion is important to them than the national average, 66 percent versus 63 percent nationally. In the most Democratic communities, the figure is under 60 percent. 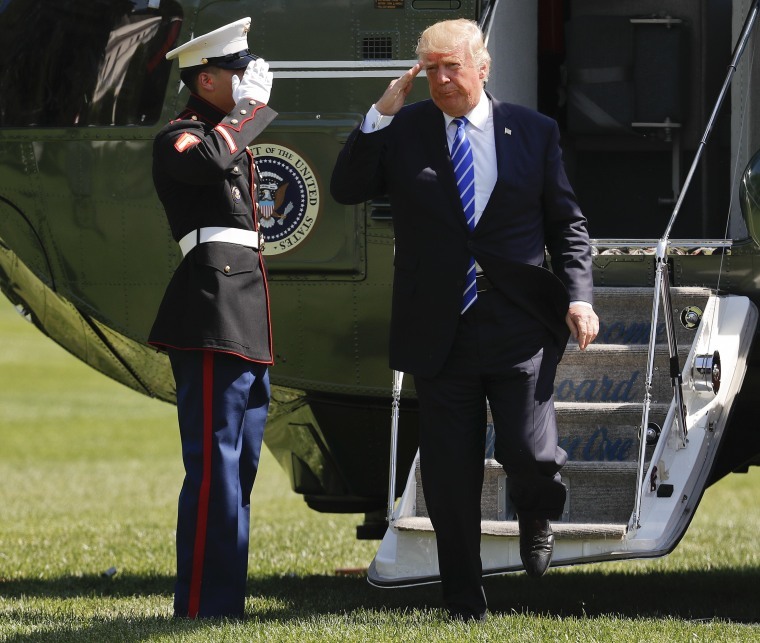 Even if it won't be easy for Democrats to break through in these military communities, however, Trump’s drop in these places is still noteworthy for what it may mean within the GOP. The nation’s military communities have long been Republican, but the poll drop in May suggests they are less “Trump Republican” now than they were when the president took office. The numbers look like a softening of support in an important part of the GOP base. And for a president who is having trouble finding support for his agenda, that softening could signal more problems in the months ahead.